As seen on the MARTHA Show! When only the BEST and most exclusive will do for the dog in your life, PuppyHugger bed is a must-have for discerning dog owners! Inspired by their own desire to see all dog & cats blissfully lounging on pet beds & pet blankets that not only feel good but also look good in any setting, Elaine & Judy have created an entire luxury line of pet accessories to accommodate any lifestyle. With quality control & customer (and pet) satisfaction as high priorities, Elaine & Judy are quick to respond to feedback & are constantly looking to improve & expand their luxury dog products line according to customer needs. For the true dog-lover (& cat lover) – the only luxury dog bed designed to hug your puppy just like you do, surrounding him (her) with the cocoon-like softness he craves. 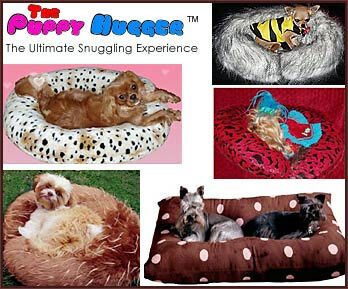 Accept no cheap imitations, your Puppy Hugger is the perfect mix of glamour & comfort. Our unique pet beds are made from divine faux-fur fabrics on the outside & supreme down-like polyester fiber on the inside to ensure the Puppy Hugger's good looks last a lifetime of wear & tear. Designed to fit in with your life-style, take this one-piece unique pet bed with you wherever you go. Give your best friend the pet bed he's guaranteed to love. One-piece design keeps dust-bunnies at bay. No hidden pockets for dust collection. Do You Have Beds For Multiple Pets? Absolutely! We have beds that can fit up to three five pound dogs all while maintaining comfort and space for each of the dogs! These beds come in our traditional style, square beds and our newest heart shaped beds! What Separates Your Pet Beds From The Competition? Quality and luxury are the most important components to our pet beds. While other beds are machine made and pedestrian, our beds are handmade, fashionable works of art. When we design a pet bed we are aiming to give your pet an experience while you have something beautiful to look at. Our competition may be low cost, but they can't compare to our quality. Do You Offer Any Other Pet Products? Absolutely! Our website shows crate pads, pet carrier inserts, pillow shams, bone shaped pillows and more can all be found in our boutiques throughout the United States, Europe, South America, Canada & Japan. Order Your Pet Bed Today! If you're looking for luxury and beauty instead of an ordinary pet bed, then look no further than Puppy Hugger Pet Beds! These handcrafted works of art will provide your pet comfort and you beauty. So what are you waiting for? Order Today!